I haven't really disappeared! I spent the week cleaning house, shipping Etsy orders,making candies for an upcoming baby shows, getting ready for LaVonne's visit and now I am at another quilt retreat! I just have to take a little break from blogging. Having a great time with a nice bunch of gals! 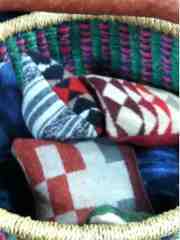 Tierney and her friend Betty Anne made us wonderful pincushions made with Pendleton wool! Happy Mother's Day wishes to all my blogger friends. A special day to honor all those who are moms and a time to remember those in our lives who "mothered" us along the way. I am thankful that I was able to be a mother and am so excited about becoming a grandmother. Enjoy your day dear friends. I've been working on my yard all week and wanted to finish up on Friday but I came down with a very bad stomach ache that shut me down for the day. Jim brought me these lovely roses for Mother's Day and some good medicine for my tubby. I managed to sleep most of the day away, but really felt better this morning. I had to finish planting up a hanging planter and I needed to pot up some pots....all fun for me! I found this hanging planter a few years ago. It's quit heavy but I really like it. It's the only hanging planter that I plant. It' so nice and works well. Here's the finished product! My friend LaVonne sent me this WONDERFUL hand forged and handmade gardening too. It's made in Montana and is almost too good to use. It is a work of art to me. Thanks again LaVonne! I found a cute hanger to add to my potting shed so I have the perfect hanger for my garden tool. I have a few shady spots in the backyard. It's fun to plant some shade plants in my backyard as my front is for sunny plants! Another shade plater ready to grace the garden. My blogger friend Shawn at Poetry in a Pot of Tea shared making a little fairy garden for May Day. It was so cute and inspired me to make a little one for myself. I think Ava will like it when she visits. Thanks Shawn for the ideas! I finished up all my planting and yard clean up and had to get cleaned up for dinner. Eric and Gina drove down from Seattle and picked Angie up. We met at Edgefield for dinner at 6:30 pm. They wanted to take me out for an early Mother's Day celebration! it was so fun and dinner was so yummy. My girls...the love of my life. Sisters~Angie and Gina. I love my girls! Thanks for making my day so special! The newly weds...they have almost been married a year...8 months already. They sure are cute! Treats from Seattle! Cookies and candies from a French bakery in Seattle! YUMMY! Don't you just love the plastic green snail watering can! Angie had an assortment of little goodies and treats! She always knowsn what I like. The little card has two little circles with birthstones....one for Ava and one for Otto! I was so touched. I can add them to my charm bracelet. One for baby Otto (due in July) and one for Miss Ava (I already think of her as my granddaughter) So sweet Angie, just like you! These two pictures are photos of Mother's Day azaleas that Jim and the girls gave me years ago. They have grown quite large. They gave me 12 and only two have survived. I'll be spending the day with Jimmy out in Aurora tomorrow after church. Looks like another fun day. My Jimmy finds such treasures when he is out shopping the Estate Sales on the weekends. Look at this BEAUTIFUL teacup he came home with last week! It is just so pretty and so perfect for spring, spring flowers and Mother's Day! I love all the colors and the design is just wonderful.Even the leaves are lovely. Nice little handle too. It is a Paragon cup and saucer which I really love to find for my collection. Of course, it is English. I got out one of my tea books that I haven't enjoyed for years. I thought it was great with the cup and saucer and perfect for Tea Time Thursday. A PERFECT Cup of Tea by Pat Ross. It is filled with great images and ephemera. Pat Ross edited this book that was originally written by a New York journalist named Arthur Gray in 1903. It really is a fun book to read and just enjoy! Jimmy found another treasure...a Cranberry Glass lemonade pitcher with 6 matching glasses. Isn't the design just darling? Lots of sweet little details and a darling design. Not sure if I could really use it to serve lemonade! I do love cranberry glass! Thank you Jim for such a special gift. I am still trying to finish up my garden work. I need to get it done before the weekend. Gina and Eric are coming down on Saturday to take me out to dinner for Mother's Day! YEAH!!!! This beautiful day was a work day in the yard today! 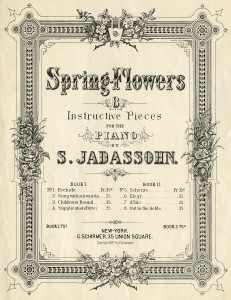 The tools were gathered, the good soil was purchased, and the flowers were chosen! The weather was a bit warm, but we drank a lot of weather and got a lot done! I snapped this picture earlier this spring before Duane cleaned out the overgrown bed. It was full of roses that spread all over the place and lots of ground cover that was just chocking the area and NOT what I wanted to look at any more. This is how it looked after Duane cleaned it all up! It's almost a triangle shape. We will get bark for both paths on each side of the new bed when I'm done planting. A cart full of new plants for my new flower bed. Lots of fun and different flowers. I wasn't sure what I would pick. I love the choosing...it's like being an artist and getting to create something special. Here's the finished project! I was so happy just to get in and dig in the dirt all day! It's good therapy. I went with lots of pinks and purples and whites. I hope to finish my front tomorrow afternoon. Jim and I will be going over to dad's in the morning to help him with a project. Just watched the news and our warm summer like weather is to continue. It's been in the 80's and really dry. I had to water the lawn today! I have lived in this little house for 37 years and I have never watered the the lawns in May! Jim put his veggie garden in today too, so we will be watering! Having a quick cup of coffee this morning before we take my car in for new brakes! It has been busy around the Colantino Cottage! We had Ava overnight again on Saturday and oh my goodness, she is so busy! It's a JOY to have all that energy around and that cute little voice to make you happy. I was SO tired when Chris and Angie picked her up. She was too and took a nap until 5 PM! Angie is doing well with her pregnancy and for that, we are so thankful. They are planning for a big baby shower over the Memorial Day weekend. Gina will be down to help. I am MISSING my Gina and Eric. Seattle isn't that far away really but it's not like having the kids live here in town. We've been getting the yard and the patio ready for summer and had our first dinner outside last night! It's been in the 80's for days, very early for warm temps in Oregon this early. Jim brought the fans over and put up the screens on the front windows. What a difference! COOL air. We do have a small AC and I think this year it will be back in business. The last two summers were so wet and cool, we didn't set it up. I have a feeling this will be a warm summer. After we drop the car off, we are going to the nursery for some plants. I had Duane clean our a flower bed that was so overgrown, so now I have a blank canvas! FUN! I had a really bad day yesterday, but am believing that today will be better. Trying to have a good attitude after some prayer time this morning. 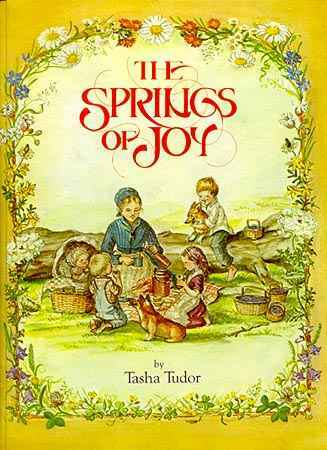 May Day and springtime have arrived so I am choosing THE SPRINGS OF JOY by Tasha Tudor for my book review for the merry month of May. The book was first published by Rand McNally in 1979. The book is 64 pages with beautiful floral end papers. This is the copy that I own. I like the illustration of the picnic on the front cover. The book cover was changed in 1998 when it was reprinted by Simon and Schuster. The size of the book was changed just a tiny bit from 12" x 9 1/2" to 11" x 9 7/32...what an odd measurement. The book is filled with wonderful illustrations by Tasha. 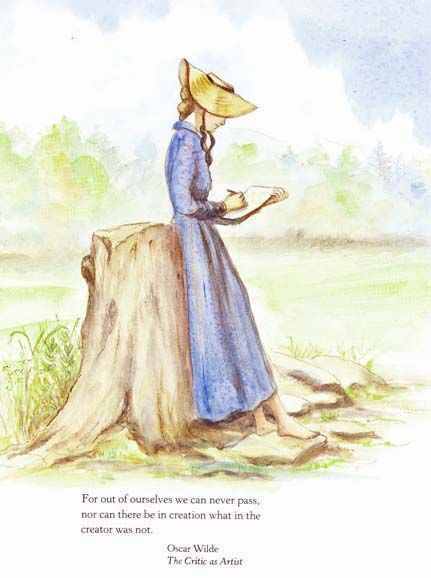 She uses inspirational quotes from famous writers including Shakespeare, Mark Twain, Thoreau and even Mother Goose. She states that there is no beginning, no end and no message to this book! I think there is a message though....a positive message about the lovely things in life and nature that can bring us great JOY. Sweet gentle pictures by Tasha-children and corgis! I love this illustration. This is so Tasha...frock and all. 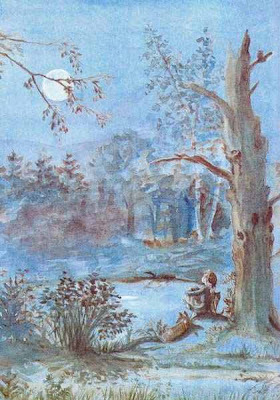 This is one of her "blue tone" illustrations that you see so often in her books. I have stated before, I don't really like these pictures. I wonder why she added one or more so often in her work. 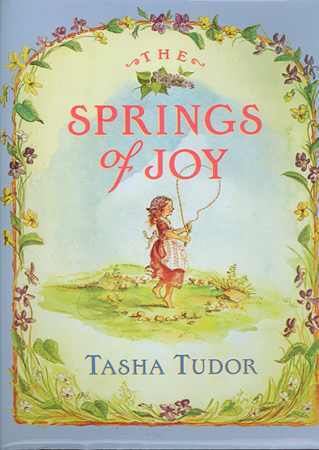 In THE SPRINGS OF JOY, you will find her childhood home, corgis, her grandchildren and even herself. It's lilac time in Oregon, so I had to share this page. I love her drawing of the lilac. Of course, this page has Tasha's signature floral border. One of my most favorite things about her work. 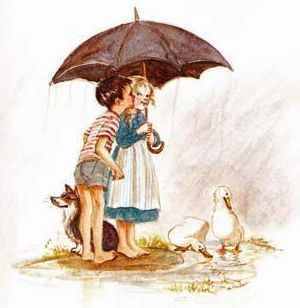 Just a simple book with lovely illustrations. Do enjoy! Happy May...plant some flowers! I have been enjoying my box of treasures from my friend Jennifer of Adventures in Mixed Media and thought these little gems would be fun to share today for TEA TIME THURSDAY. I love old paper and Jennifer picked out some very special things for me. This is a vintage card for Mother. It could be a Mother's Day card or a birthday card. It has a very sweet message inside. Isn't it just adorable? I love the roses on the cup. This little teacup must have come out of a scrapbook. It's an advertising piece from a furniture company. The last time I went to tea, I wore my tea and heart charm bracelet. I love charm bracelets and enjoy wearing them. The charm in the center says "TEA CHAIRMAN" and I just think it's a riot. I get to be chairman when we go to tea. I found it years ago at an antique shoppe. I bet you are thinking, what is that? My friend Nancy helped me make it at the quilt retreat. You make this pillow out of two fat quarters. It's sewn so you get a neat shape. It's to use to prop up your hands or arms when you do hand work. The strap is for carrying when your arms might be full! I had to quilt the fabric with my machine first. That was really fun, but took quite a bit of time. I like the look and it made the pillow better. I love the teacup fabric that I found a few days before the retreat. I had no idea what I was going to make out of it! I just decided to take it with me to the retreat....perfect! Do you remember when I did the blog post on my friend Lynda and the friendship ball? I had coffee with her on Monday morning and it was my turn to receive the ball. I was so excited and wondered what she had picked for me. Inside was this adorable bird and little scripture verse. 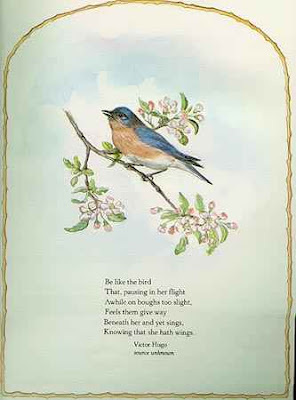 Lynda love birds and how perfect for spring. Then I found this tiny charm that says BLESSED. I had tears in my eyes when I read the little note she had tucked inside about being my friend. I am blessed to have her for a friend! This little friendship ball is really fun! Happy Tea Time Thursday. Such a busy week! 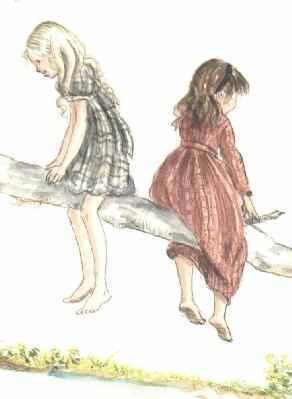 This Friday will be my Tasha Tudor First Friday Book Review. Stop back over for the review.